I just love Throw-Back-Thursday or otherwise known as tbt. I love seeing all the pictures on Facebook and at times I will get tagged in pictures from my younger days. I thought it would be a great idea to make every Thursday here a tbt with a great recipe from my parents or grandparents. So today I am sharing with you a very simple recipe for yeast bread. This recipe comes from my mom who uses it for her homemade rolls. When I made this yesterday for my family, I made it into two loaves of bread. I thought I would share a picture of my mom. 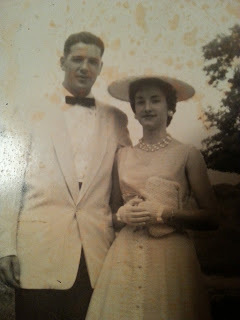 In fact this is my mom and dad circa 1960. They were not married yet, but I believe that they were engaged at this time. They were on their way to my dad's brother's wedding. I just love the clothes, the hat, the gloves. Ah, why can't we dress like that anymore? Anyway, back to the bread. Have you ever gotten recipes from your family and just by looking at it you know that not all the steps are included? Well this is how this recipe was. 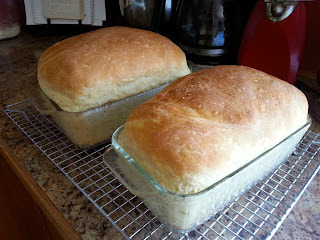 Luckily I love to bake and I knew the steps to making the bread. I will of course include the steps here for you. Mix first 6 ingredients together. Place in a greased bowl and cover. This will also keep in refrigerator. So here are my ingredients that I have ready for the bread. 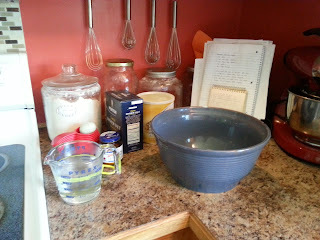 I just have to say that I love my little baking corner that I have set up in my kitchen. It makes it so handy to bake, and cook for that matter! I do mix the first 6 ingredients together and that is what you see next. Actually you see them before I mix them together. 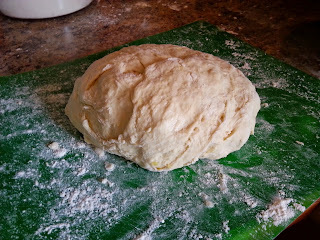 Next I add the flour. I first add 3 cups and mix it up. Then I add another 2 cups and mix that. That is what you see below. 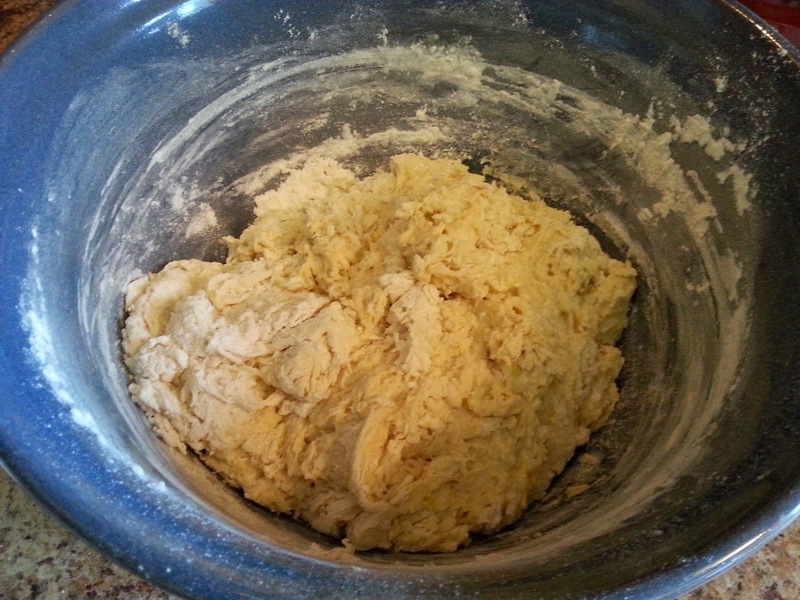 It is a sticky dough and it still needs more flour, but I like to add that last cup as I am kneading the dough. So here is my dough after I have kneaded the last cup into the dough. You want a nice and soft smooth dough. Now this is where you will put it in a greased bowl and cover. From here you have two options. You can let it rise which is what I did. 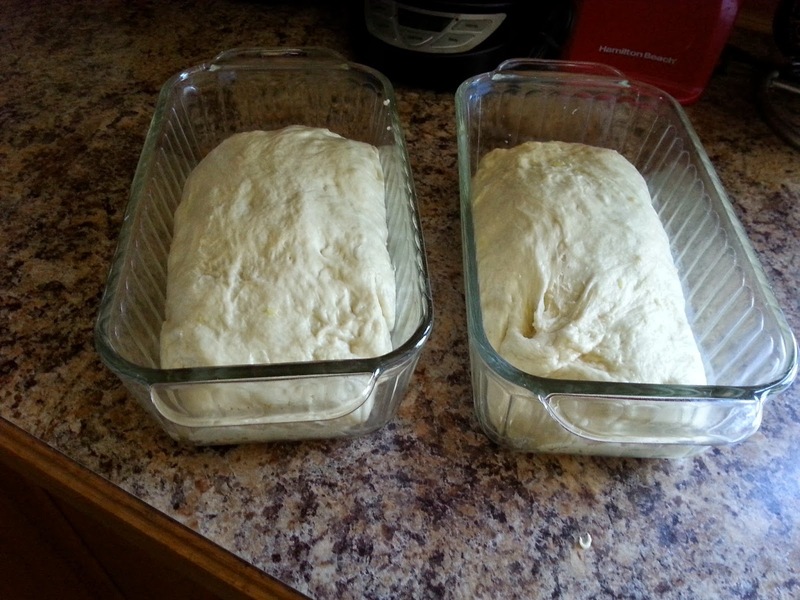 You want it to rise until doubled which for me was about an hour. 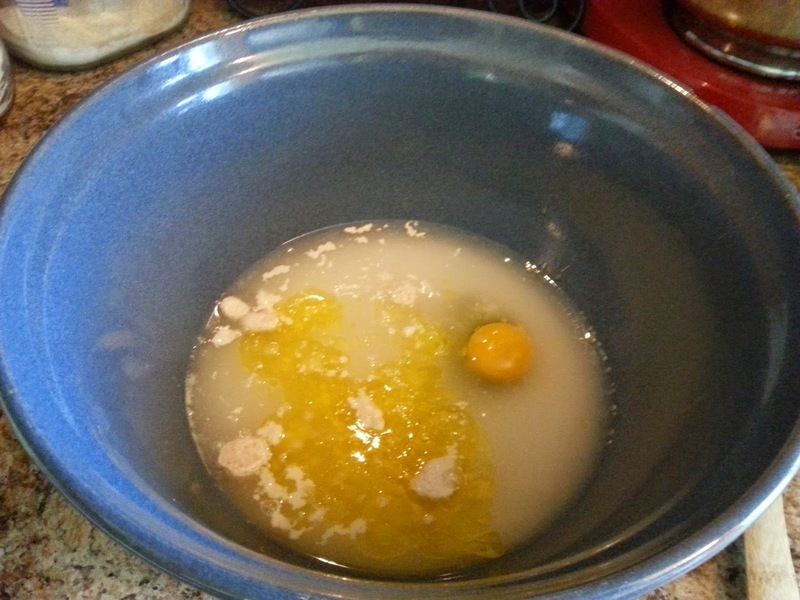 Or you can put it in the refrigerator overnight and take it out the next day to get it ready for the second rising. 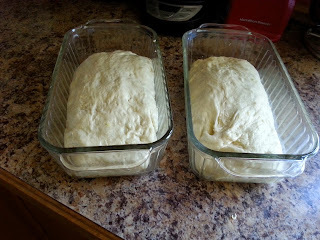 So here you see how my dough has doubled. 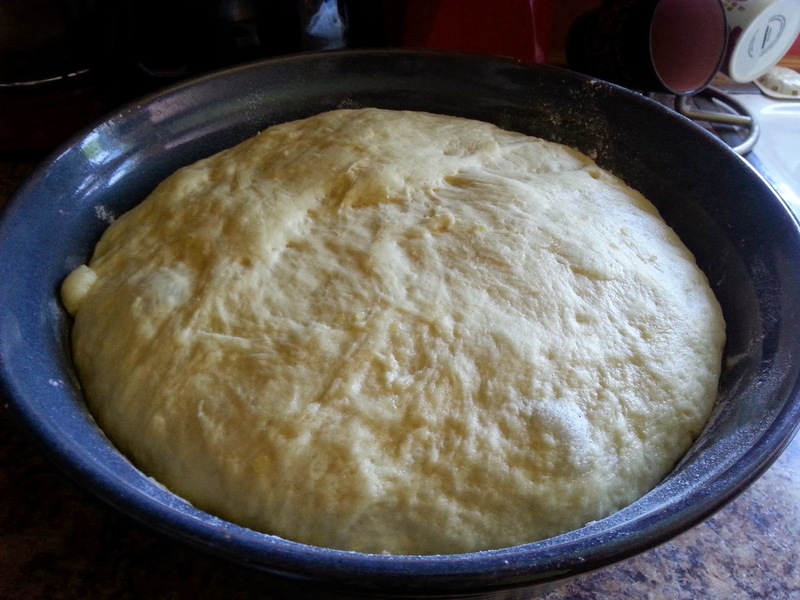 I need to take out the dough and divide it in two equal parts. 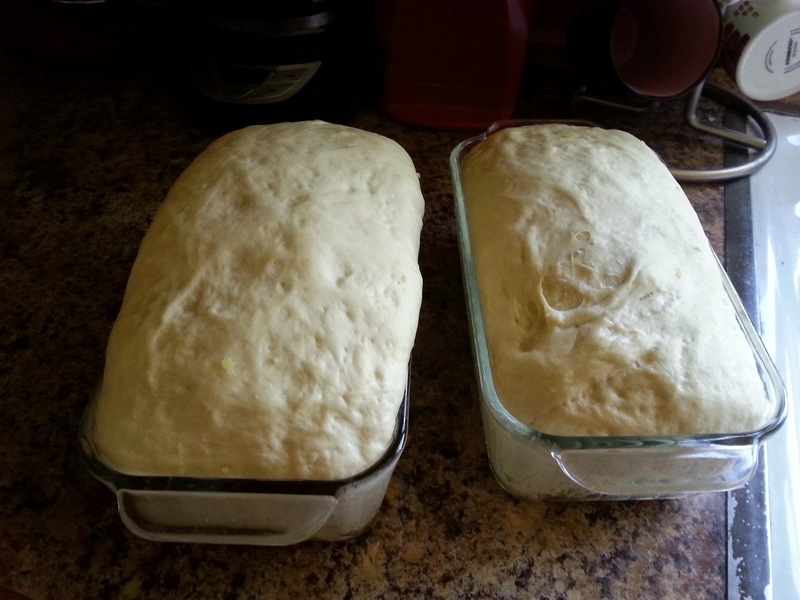 Now they are ready to bake in a 350°F preheated oven. They will need to bake for 25-30 minutes. See my beautiful loaves below! Now the hardest part of the whole recipe is waiting until they are cool to slice into them. What a beautiful soft bread! 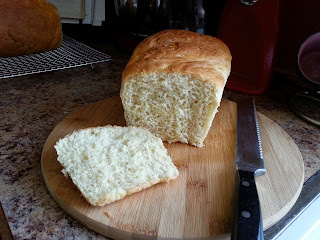 Tastes so wonderful and I love this bread toasted with some homemade jelly on top! To get the printable version of this recipe, go here. Tell me in the comments below what you think of this recipe and let me know if you have a favorite bread recipe.